The Leader of the Right? 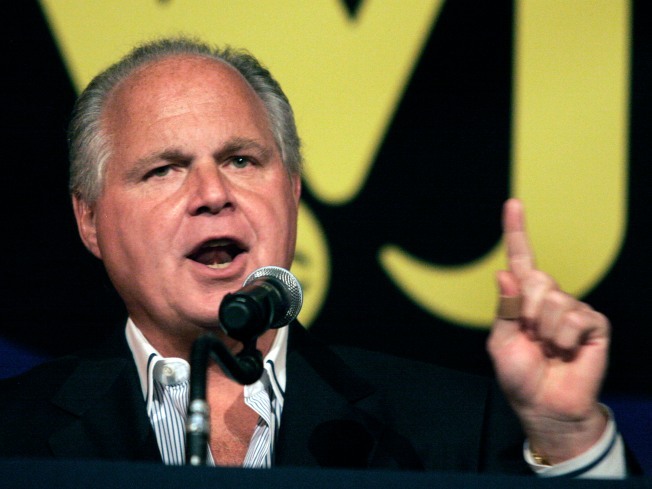 Radio talk show host Rush Limbaugh says he "hopes Obama fails." Obama urges congressional Republicans not to listen to Rush. Is the battle joined? President Obama may have committed his first unforced error. In a meeting with congressional Republican leadership last week, Obama said, "You can't just listen to Rush Limbaugh to get things done." The comment was seen as a rejoinder to Limbaugh's comment on Obama: "I hope he fails." As noted here on Friday. Of course, Limbaugh hopes Obama fails! He's a conservative radio talk show host with between 14-20 million listeners -- most of them as conservative as he is. That's his "base." But why does Obama care about what Limbaugh thinks? He has a larger Democratic majority in the House and Senate than Bill Clinton ever did in 1993-94. So, he can get legislation passed without any Republican support. Besides, a president has the power to influence public perception -- and the general Zeitgeist -- far more than a single member of the media. Even someone with a potential 20 million audience like Limbaugh. Obama's stimulus package -- $825 billion and counting -- can pass whether one Republican votes for it or not. Either Obama has the courage and commitment to push that forward resisting any and all GOP attempts to block it -- or he doesn't. Singling out one conservative talk show host demonstrates weakness from a chief executive who should have little to fear. On the other hand, perhaps Obama made his mistake earlier -- two weeks ago when he dined with the conservative media elite at the home of syndicated columnist George Will. In attendance were luminaries such as Bill Kristol, Peggy Noonan, and Paul Gigot. Notably not present was Mr. Limbaugh. Now, no one knows whether Limbaugh was invited, but elected not to attend -- or wasn't on the list at all. Either way, it certainly fits Limbaugh's status as the "outsider" -- among both the mainstream and conservative elite: He's now seen as the one who is in no way "compromised" by the new president. Thus, he's free to declare full fledged war against Obama. Moreover, Obama is actually elevating Limbaugh by mentioning him in a meeting with congressional Republicans -- making it sound like he's listening to the man that Obama says the GOP shouldn't be listening to! That's known as a mixed message. Better believe that Limbaugh is loving every minute of it. Robert A. George is a New York writer who blogs at Ragged Thots and dabbles in stand-up comedy.